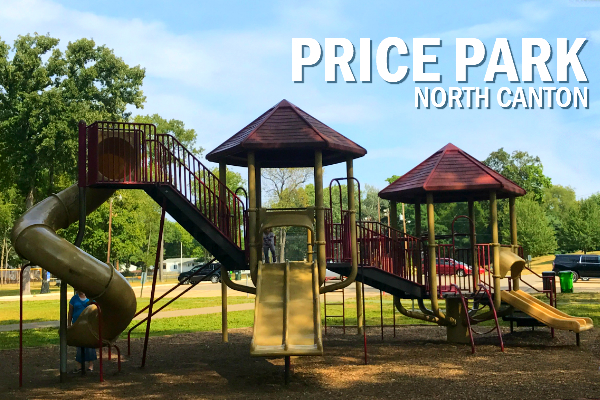 Price Park is a beautiful 18.5 acre park located in North Canton Ohio. The park offers many activities for both adults and children. Our favorite things to do at the park include, feeding the ducks, playing on the playground and walking on the paved trail. 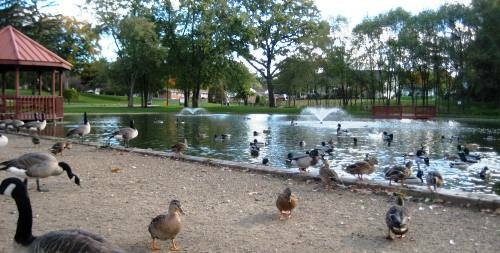 There are quite a few ducks and geese who call Price Park home. Because they are accustomed to being fed, they are not afraid to come close to you. In fact, if you walk in the general area of the pond with food in hand, they will come quickly. Very quickly! While I enjoy how close the ducks come, it could get a little overwhelming for young children, especially when the geese get involved. In our experience the ducks and geese are always friendly, but they will attempt to take food out of our hands. Because of this I highly recommend standing close to young children who are feeding the ducks. Helpful Tip – Before you head out to feed the ducks. Check out this article from National Geographic that includes details on what food items are safe for ducks to eat. The playground is another one of the spots we frequent. The main playground structure is equipped with various climbing structures, a covered platform, multiple slides, and monkey bars. The playground also contains a toddler structure, infant and regular swings, and multiple climbing structures. There are also benches, a drinking fountain and restrooms nearby. 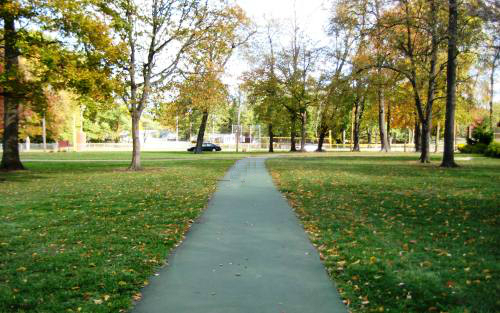 A one mile paved path winds through the park, past the playground, pond and pavilions. They've even placed benches at convenient locations along the path for anyone in need of a rest. The park is also a hot spot for PokémonGo Players with many pokéstops, gym & pokémon to catch. If geocaching is your thing, you'll also find some caches hidden in the park. The paved trail is perfect for strollers. A jogging stroller also works well on the trails that are unpaved. There is a lot of shade at the park, even on the playground. This makes it a great destination in the summer months because the kids can play outside without being in the complete sun. Dogs are welcome at the park, but they are not supposed to be within 15 feet of the walking path. Have Tips to About Price Park to share? Leave a comment below to let us know. Thanks!